Why is this a mistake? A) Everyone knows that Super Bowl food should be snack-based, not sit down meal type of food. Duh. B) I love snacks. LOVE them. In fact, in college I even choreographed a dance in honor of my favorite snack, Hot Pockets. So why, with a strong history of snack loving, would I decide to make a full dinner DURING the Super Bowl? Madness. Awkward madness. C) How am I supposed to watch the game and be all seductively adorable if I’m cursing in the kitchen the whole time? Oh Jean. Why is this a mistake? A) I’ve never made this meal before. B) This meal requires frying… as in a vat of hot oil and Jean. NEVER is this a good idea. C) I’ve never fried chicken before… do not be fooled, it is an art. As the kick-off approached I started to think that I had MAYBE over-extended myself on this cooking gig. Suddenly I realized that I’d never ACTUALLY made mashed potatoes before, and while I watched my sister make the Chicken Milanese I wasn’t very confident in my own chicken frying. I mean, she told me to cut the breasts in half so they weren’t “too thick” but… how thick is too thick? I mean, one end was really thin and then it seemed to get fatter… did I need to cut them in half still? Maybe cut the thick half off and then cut that in half again? Hmm… And the potatoes, how long do they have to boil? How much butter and milk do I put in? At least I knew I had the Brussel Sprouts down to a science – I’ve made them plenty of times. And Crush did want the rolls, so that’s one more thing that needed to go in the oven. So now I had to time out the oven usage. UGH. I REALLY should have thought of some of these things before he was sitting on my couch. And I offered him a drink, but do I need to keep refreshing his drink or do I tell him to make himself at home and help himself? Would he rather feel comfortable in my home, getting his own drink or am I supposed to still be a proper hostess and keep checking on him? These are the thoughts that were rambling through my head as I peeled potatoes (is four too many? Not enough? 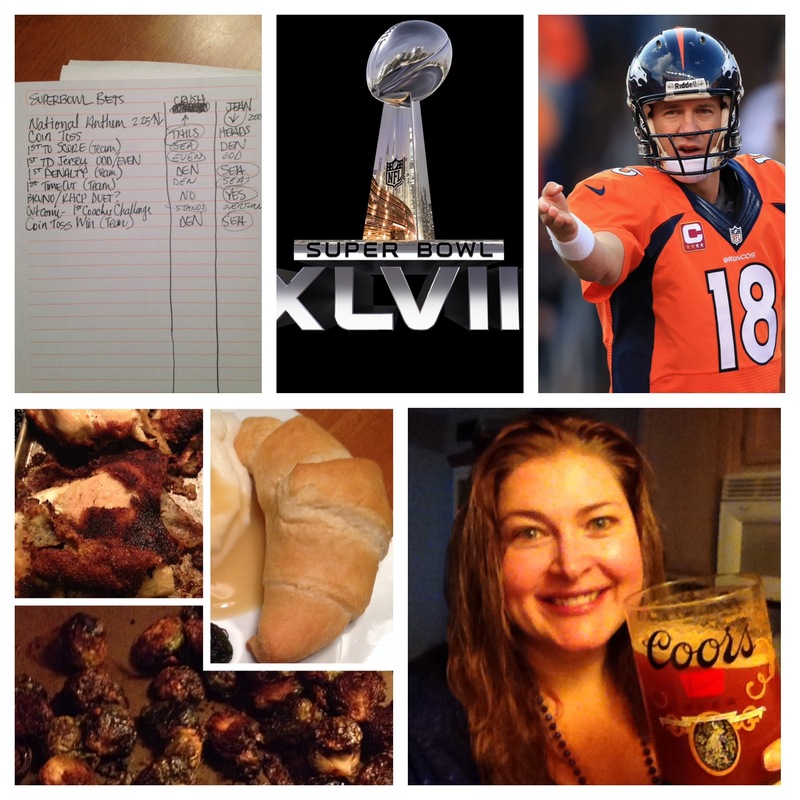 ), pounded the fat end of the chicken with a meat cleaver, freaked out over what I was sure was salmonella juice sprayed everywhere and had to wipe down the entire kitchen with my trusty antibacterial wipes… By the end of the first quarter my cooking was already resembling Peyton’s playing. A disaster was developing, but I naively thought I had plenty of time to salvage it… And, like Peyton, I was wrong. By the second quarter I had smoke billowing from my burnt-raw chicken, a seemingly impossible paradox, but trust me Awkward Chef Jean had managed it, but everything else was going well. The brussel sprouts were nicely sautéed and awaiting the oven, the potatoes were perfectly boiled and drained… Now what to do with the chicken… Hmm… I decided I could maybe bake it some to hopefully get it cooked through without getting too burnt… So, I threw it in with the brussel sprouts and sat down to enjoy half time. So, I put the crescent rolls in the oven, and started mashing the potatoes… which it turns out were now cold… and the butter was not mixing, but rather turning into big chunks… UGH!! Okay, focus. I’ve got this – I simply put the, now mashed, potatoes back on the stove while I worked on the gravy. Surely the gravy will be a success – it’s a packet. You just add water. BAM! I’m back in the game… except of course the gravy wouldn’t thicken, the bottom of the potatoes started burning and I was so busy stirring both of those, opening the wine, assuring Crush I had it all under control and we’d be eating soon… that I didn’t realize the rolls were almost burning – Mad dash to the oven, grab an oven mitt and WHEW!! The rolls are just right – I got to them just in time, but… Um, I didn’t exactly have any place to put the hot tray. My little townhouse kitchen is not spacious and the counters and stove were already covered with things… so now I’m just holding this hot tray, trying to scrap burnt potato off the bottom of a pan and the gravy begins to boil over because, why wouldn’t turning the heat up make it get thick?? By the beginning of the fourth quarter I had our meals plated and ready to serve—may master plan was to cover the mess with the gravy to hide it, but sadly Crush didn’t want gravy. Damn. This is about when I realized my guest had just spent the majority of this awful game, watching his hero Peyton Manning getting crushed as he drowned his sorrows in whiskey and tried to avoid the smoky burn of my cooking that wafted through the house. So basically he was already drunk and disappointed – sweet!! He was perfectly primed for the meal I was about to serve. I have to say I was impressed, Crush ate everything on his plate, even went back for seconds, and his comment on the meal? They damn well better be – I carried that tray around for a good ten minutes while I finished destroying everything else! As I lay there with the little charges surging through my muscles helping me relax I suddenly realized I was a little too relaxed. And sadly I realized this too late. You guessed it. Suddenly, without warning or provocation, abruptly aggressive and loud flatulence was released. In front of Crush. Oh. Dear. God. And… that’s more or less how my Super Bowl went. Peyton, when I say I feel your pain, trust me… I feel your pain.